The SUCCCE product is a handsfree, advanced decision support for alert management and consists of both hardware and software. SUCCCE provides medical doctors and other health care staff with direct alerts from medical devices and adequate medical information concerning their patients on a heads-up display in their eyes' field of view. The advanced data filtering in SUCCCE makes sure that the alerts and information are recieved by staff with matching responsibilities. 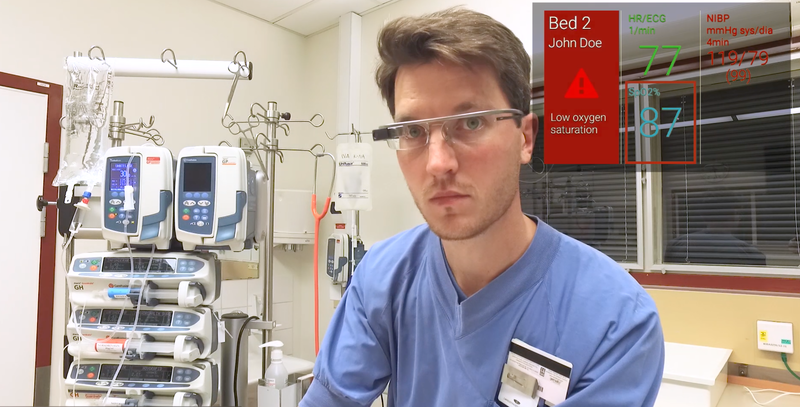 By using smart glasses with a heads-up display that is handsfree and intuitively operated, and two-way communication (voice, pictures and film), staff get access to medical information to support the alert management. Filtered, sorted and overall information. Cleaner and user / role custome information. Hands-free, thanks to the voice control. Ability to communication between users regarding notes, photos and film. New features customized for user needs. Different alarms according to severity, different users (i.e. specialists, doctors, nurses) and patient responsibility. 'Rewind' to the time before the alarm to see scenarios prior to the alarm event. 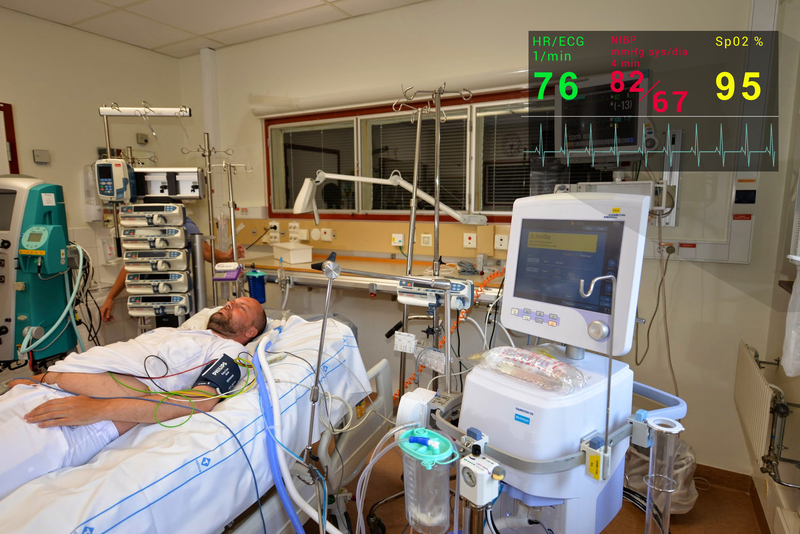 Monitoring of several hospital beds simultaneously. Shorter time from alarm to decisions about medical intervention and subsequent treatment. Shorter hospital stays - lower costs and improved experience for the patient. Increased quality of selected medical intervention. More efficient care – lower health care costs per care days and / or hours. Fewer mistakes in care - lower costs and higher soft values for the patient. Improved patient and family environment. Reduced alarm stress – less risk of add on diseases, lower costs and higher soft values. Improved work environment – reduced sick leave costs and increased soft values. More interesting workplace - higher soft values and reduced recruitment costs. Better utilization of human resources - reduced personnel costs. Increased access to hospital beds thanks to the efficient use. 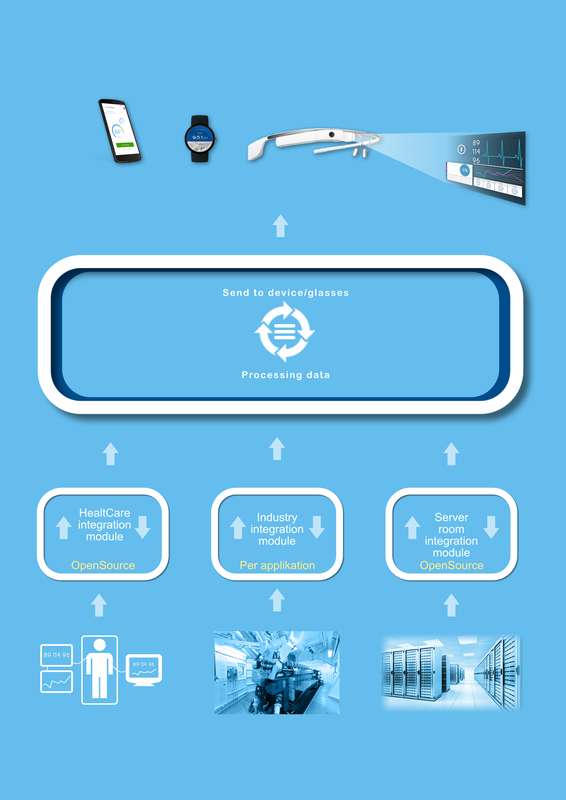 SUCCCE is based on the concept of using existing communication APIs from suppliers of measurement equipment. As these are often of different types or handles data differently, we use ready-made solutions for managing communication with the patient. We connect with an open source solution that streams data to our server. The server in turn takes care of the data and decides who it should be sent to. Our central SUCCCE box then sends the data on to the selected device. In our pilot, we used Glass from Google. But the data can just as easily be sent to glasses from Vuzix, smart watch or a smartphone. 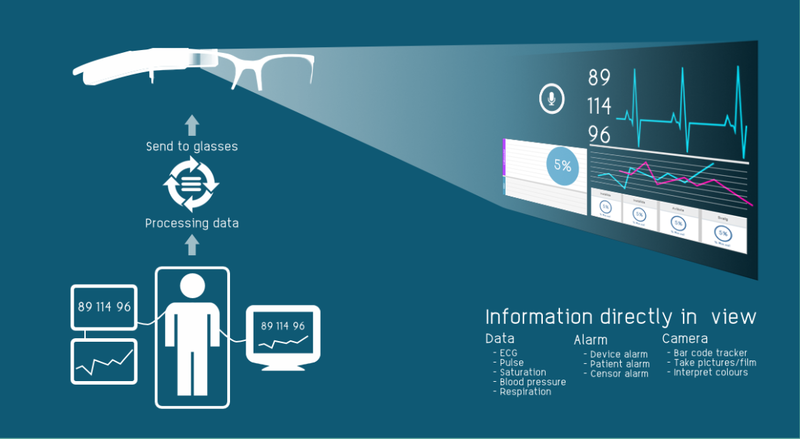 Smart glasses are a wearable laptop, worn like regular prescription glasses. One can best describe the glass as a development of the smartphone – a way to freely access data without looking at or touching a handheld device. A head-up display shown just above the eye presents the data in the field of view without obstructing the view. The technology is designed to be as comfortable as possible and still present data clearly without obstructing the view or having to move the eyes. It is designed to give the user all the benefits of a smartphone, without having to hold the device and disrupt concentration. Smart glasses allows the user to surf the Internet, get directions, send text messages (SMS and email), take pictures, communicate and interact per a simple and compact device.